Don't miss the party because you failed to book in advance! Dates fill up fast, so don't put off booking your photo booth for your next important event! Click the button below to fill out our request for to secure your date. Let Our Photo Booth Capture the Fun for You! Our photo booth is sleek, stylish, and fun! "Let us bring excitement to your next party or event." Most photo booths look tacky, we changed that. We designed our Photo Booth to be small, sleek, and beautiful so it fits in at every venue. You can choose between 2×6 strips or 4×6 single prints. We customize your photo templates to have any graphic, logo, or layout you would like. Booths come standard with professional quality DSLR cameras & high-end studio lighting that combine to create beautiful images. Printing is just a click away with responsive touch screen interface. All of our packages come with plenty of props to help create fun and memorable pictures at your holiday party, wedding, or special event. Whether re-filling the ink cartridges or just laughing with your guests, our whole goal is to make sure you have a 5-star experience! You have the option to share. Your guests can instantly send their images to their email or post photographs directly to Facebook! No waiting around to show off your party! Are you a School, Church or Non-Profit? "Let us bring the excitement to your next party or event." Birthday parties are a blast when you add in our photo booth, props, & a awesome attendant. Don't let this special moment pass without capturing it with our photo booth, photographer, and DJ! 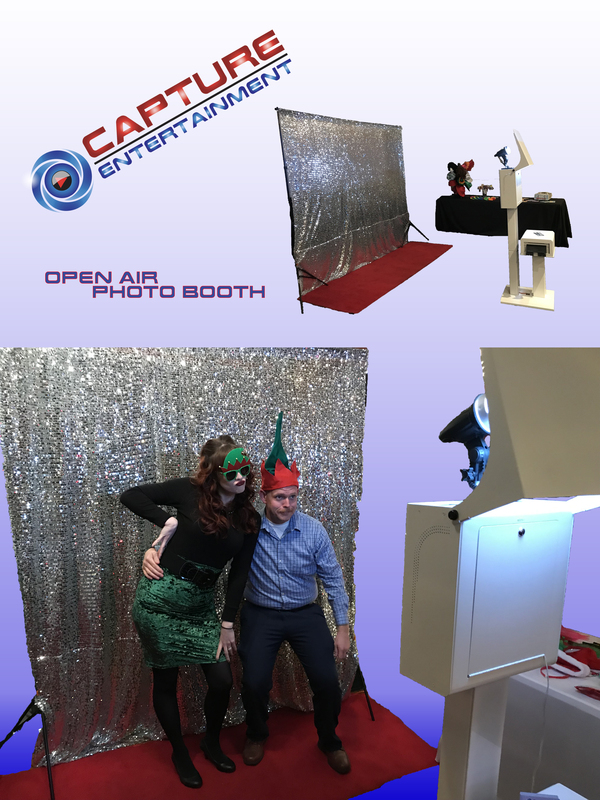 Make your next holiday or party shine and stand out above the rest with our photo booth! Let us help close out the school year with a graduation bash with our DJ & photo booth, and more! Corporate events need excitement too! Don't let your event be forgettable, let us help make it memorable. This celebration only happens once in a lifetime. Let us help you make it a lasting memory for all time! How far in advance do we need to make a reservation? As long as we are not booked, you can always make a reservation with us. However, we recommend making reservations as early as possible. How many times can we take photos during the event? You can take unlimited number of photos. How fast do we get our prints? Most photos print out within 10 seconds. We use high quality printers in all the events. What kind of photo layouts can we choose from? You have the choice of the classic 2x6 strips or the popular 4x6 frame. You can see examples of these prints on this web page. Can we customize the print layout (template)? Yes, you can add your own text and/or logo to the templates we provide, or we can customized a design completely to match your event. How much time do you need for setup? We usually arrive from 1 to 1.5 hours ahead of the photo booth start time to setup. We recommend allowing a 10ft x 10ft space to setup properly, place props, and allow guests to come in and out. Do you provide photo booth rental services outside LA County and Orange County? Travel fees are free within 30 miles of La Habra, CA 90631. Anywhere outside of that will be $1.50 per additional mile. Can guests download photos from the event online? Of course, We upload photos to the online gallery 2-3 business days after the event for you guests to view, download, and share. Can I get a replacement thumb drive of all images? I lost my original. Sure. We can have one sent to you for $25 as long as your gallery is still available. If you just need a zip file you can order one for $15. Please email us at info@captureent.com to request a replacement. The deposit payment is nonrefundable. The balance is refundable if we receive written cancellation more than 15 days prior to the event date. Capture Entertainment gladly accepts cash, checks, money orders and credit cards. (A 2% fee applies to credit card transactions, with exception of deposit payments).